Las Vegas, Nevada, is one incredible architecture for exterior and interior design, is best combination of sharpes and colors, is one fascinate design like a dream, is a reference for many designers and have a great pieces of interior design and modern architecture. The intent of this design was to create a modern, art-gallery-style space to entertain hip, young guests and partygoers. The 11-foot custom-designed aluminum front door opens to striped Italian floor tile, a three-story elevator tower surrounded with custom art, and a floating staircase trimmed with stainless steel. A 14-foot wide fireplace is the primary feature of the kitchen and living space, accompanied by Scavolini cabinets and metallic silver hardwood floors. Blue LED lighting glows around the second tier ceiling which extends from the kitchen and down the media wall and fireplace; it also accents the ceiling of the master bath. The residence is located in The Ridges, an upscale custom home community to the west of Las Vegas nearing Red Rock Canyon. The home is 10,000 square feet. Design began in June of 2009 and construction was completed in January of 2011.
sure, it is totally customizable, in color option. 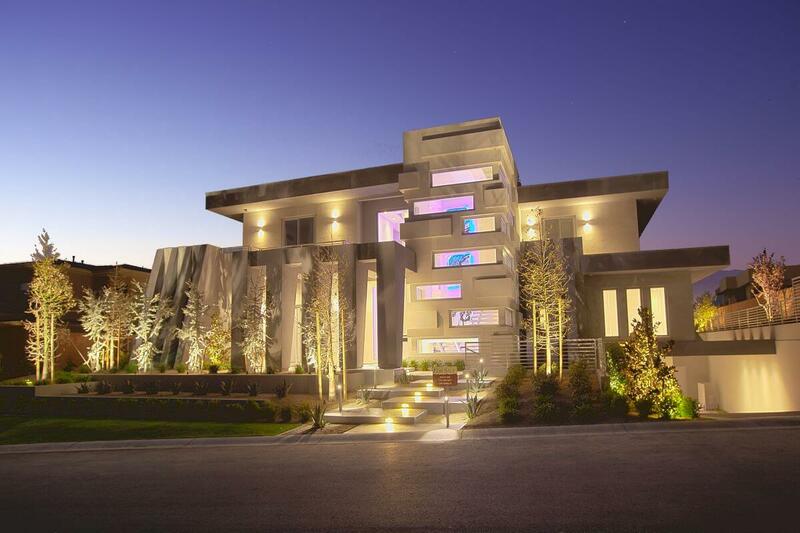 The Hurtado Residence Design by Mark Tracy in Las Vegas is very beautiful and very interesting I am very menyukainnya, thank you for the information. I find this building and design absolutely outstanding. Everything seems to flow together perfectly. Thanks for sharing.